Produce a log format specifically to display, interpret and analyse specific tools or datasets acquired during drilling of a shale gas well. Conventional lithology and Composite log formats do not always provide the space or dedicated context for data sets acquired for shale gas wells. With GEOSuite 7 these data sets are accounted for and can be set side by side with your conventional data sets to produce a hybrid log format. As part of the default offering within the installation of the GEO application comes a template designed to support data specifically acquired during the drilling of shale gas wells. This can be used during drilling for increased understanding or post drilling for final presentation and fracking program decisions. The 'Unconventional Complog' includes the following features. The template can be further customised by creating bespoke TOC calculations based on environmental characteristics of your operational region. The TOC calculation for the region is set in the template and can automatically compute when the source data is loaded giving instant insight into where high organic shales are present. Image data display together with a fracture type interpretation can support the TOC indicators for the most fractured shales, assisting with 'frack' program decisions. Standard Gas readings from the chromatograph presented against lab derived tests on gas content from core can further lead to clearer interpretations of gas prone shales. 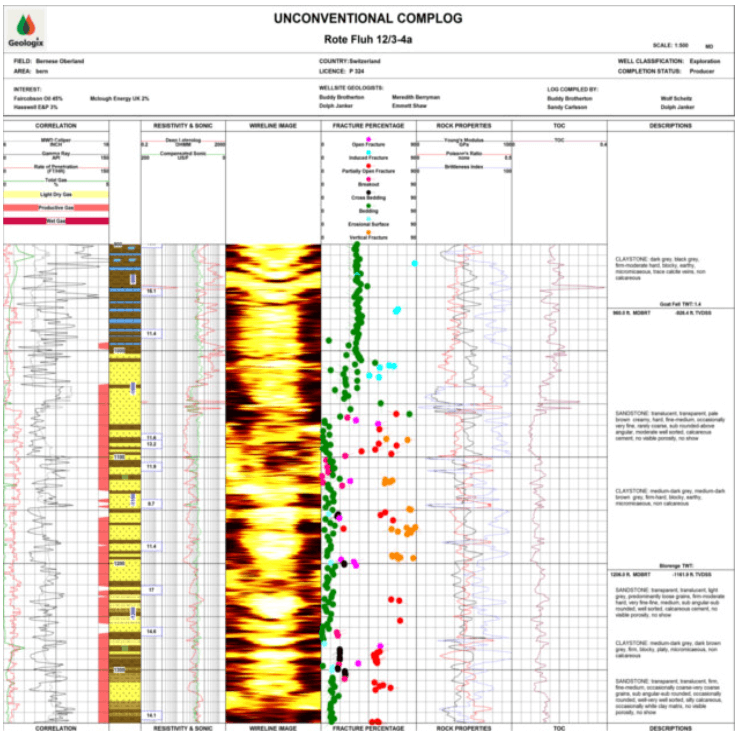 The Unconventional Complog can be used to provide your company with a more focused final log presentation and for submission to regulatory bodies that may want an increased understanding of the well beyond conventional composite log formats. The GEO Shale Gas Well Log presentation is unique and has been used to help our customers understand their data on multiple shale gas wells.